I’ve been using the Medtronic MiniMed 670G pump for about 6 weeks now, in Auto Mode for about 4 weeks. I’m in Canada, so the BG units are in mmol/L instead of mg/dL (multiply by 18 to convert). I’ll convert here to mg/dL. I’ve been having problems with the pump giving enough insulin for a correction bolus. I discovered recently that the Inulin Sensitivity Factor (ISF) entered in the Settings is only used in Manual Mode. In an effort to test the first hypothesis, this morning my fasting BG was 165.6mg/dL (actually, 9.2mmol/L). The pump offered to give me a 0.4U correction bolus, presumably to bring me down to 150, a 15.6mg/dL adjustment. This implies “the algorithm” thinks my ISF is 15.6/0.4=39mg/U. This is a huge difference from my MM ISF of 18mg/U (actually, 1.0mmol/U). My 6-day average TDD is 56.3542U. The 1800 rule would compute an ISF of 1800/56.35=32mg/U. So… What’s going on here? Can anyone shed some insight? I’m very frustrated and it’s hard to resist the urge to enter phantom carbs. Could this be another software bug due to the unit change? I’ve also recently found out that due to a software calculation error, “Rise Alert” is broken and should not be used outside the US (screenshot attached). Could this be a similar problem? I have been on the 670G auto mode for just over a year. I do not understand the 1800 factor. My 6 day insulin use is 78. If i devide 78 into 1800 I get 23. My insulin resistance factor is 40:1. When I do a Bolus Correction (without any insulin on board), the Pump seems to be using the 40:1 factor, not a 23:1 factor. You might work on active insulin time. I do not knwo where yours is set, but that can have a bigger impact in auto mode than the sensitivity factor. I suggest lowering it by increments of 15 minutes until you dial it in a little better. Typically in my area people start with around 3.5 hours instead of 4. Some people have it set as high as 5 hours and in my case i have it set very low at 2.5 hours. You must of course discuss the adjustments with your doctor or educator. Note: I am a Medtronic ambassador. My opinions are my own. They did not pay me to say nice things about Medtronic devices or the company. OK, they sent me a shirt and a cup but even I am more expensive than that. AIT does indeed play a role in providing overall control and I have been adjusting it. AIT however doesn’t seem to play a big role when administering a correction bolus, which is the issue I’m trying to understand. My AIT is 2.45 hrs. I get so irritated with this system! I rarely go into AM but when I do it only lasts a day or two. Usually I get stuck over 250 and turn it off so I can bring my highs down. So, it took me a while to get my head around this, but the main thing is that microbolusing is not the same as a basal rate. 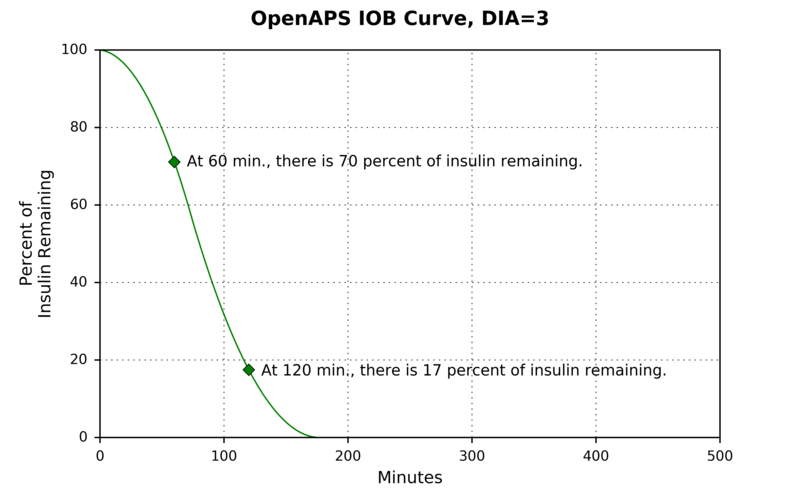 Each one of those little blips of insulin is being calculated individually based on a number of factors, including the duration curve of the insulin. Obviously with the blips coming every 5 minutes, those curves are all going to overlap, so basically AIT is a way of dialing up or down how much overlap to allow. This applies as much to corrections as to boluses. The more overlap you allow by decreasing AIT, the more aggressive the pump will be. But with corrections there’s an additional complicating factor, namely that corrections are calculated to a target of 150, so that imposes a secondary limit on how hard it’s going to work to bring down a spike. But AIT is really the one big tool you have in auto. In my case I had to dial it all the way back to 2hrs, and wished I could have dropped it further because the algorithm was so anemic about corrections. Thank you very much! This makes sense and is helpful but doesn’t resolve my question. At a specific time (say, time X), your BG is high (say, 250) and it wants to target 150. If the AIT is 3 hours, it’s going to add up all those curves over the past X-3 hours. Let’s say it’s 3U on board. In order to make that adjustment, the pump has to calculate how much insulin is needed to go from 250 to 150 (delta 100) and subtract the IOB from that. This is the same kind of calculation it does in Manual Mode, but the insulin sensitivity is computed… Differently. This is what I’m after. So… How does it calculate sensitivity in Auto Mode? but the insulin sensitivity is computed… Differently. This is what I’m after. RIght–it’s not using a preset, user-entered value (i.e., the one you configure for Manual Mode), but determining it based on observed patterns that are incorporated into the algorithm. And that’s where we come up against the black-box problem, because MedT just isn’t all that forthcoming about precisely how the algorithm does what it does. I know when I was using the 670 the discussion groups were full of guesses about things like this that MedT simply wasn’t going to answer. For me that was the big flaw in the whole philosophy of their pump: “Let us do everything for you!” is the promise, but in practice “Just shut up and obey” is closer to what it feels like. Just the value you see in the bolus wizard, but I don’t think that includes basal in either mode. Somewhat more responsive to the original problem you stated, viz., the anemic correction rate you’re experiencing: I also struggled with that for a while before finding out that the ISF setting did not apply in automode, but I did find that backing down AIT caused it to be more aggressive. Unfortunately I hit the 2.0 hr barrier before I really got it to where I would have liked. Like you, I was trying to resist the “phantom bolus” dodge, so I was pretty stuck at that point. But as a practical matter that’s the thing to adjust–it will get you more robust corrections. Are we at a point where we just need to reverse engineer these algorithms? My ISF is 40. My BGs are currently 100. I have 1 unit of active insulin on board. As an experiment, I went to Bolus and set my BG at 200 and the calculated Bolus came back at 1.2. If you add the 1 unit of insulin on board that would give me 2.2units of insulin to bring down my 200 BGs. Using a 40 ISF, that would reduce my BG to 112 (40 X 2.2). In my opinion, that is a fairly aggressive correction.